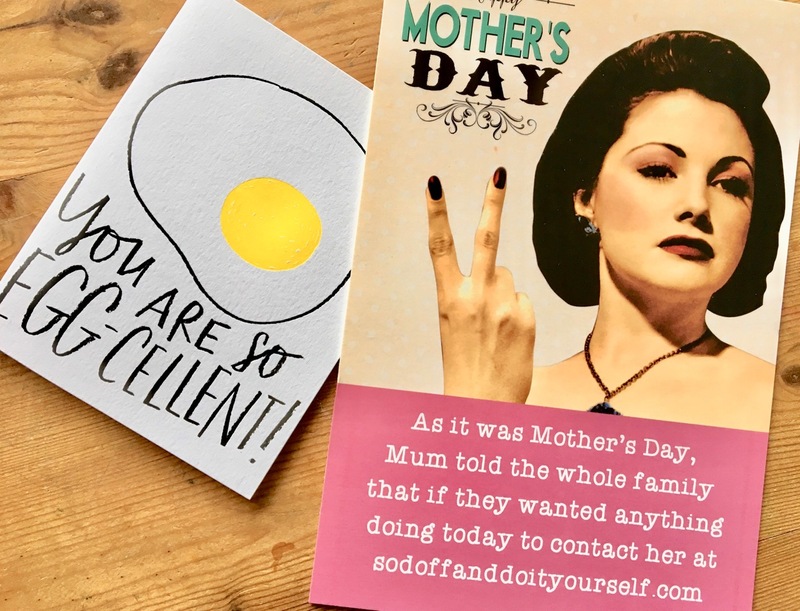 My Mother’s Day celebrations started on Friday when my daughter A took me out to lunch at my favourite local eaterie ‘Feed the Soul’ in Godmanstone. That’s Nick preparing our matcha green teas with great care and panache – he co-runs the restaurant with his sister who creates the most beautiful and delicious vegetarian and vegan foods. A had a matcha latte with oat milk, I had a plain matcha. And look, my nail varnish matched the pottery – I love little moments of serendipity like that. We took a while to decide what to have as everything is so good. The soup of the day was Pea Soup and I was very tempted as it was cold and raining outside …..
Let me tell you – those kale crisps were surprisingly gorgeous and oh so tasty! 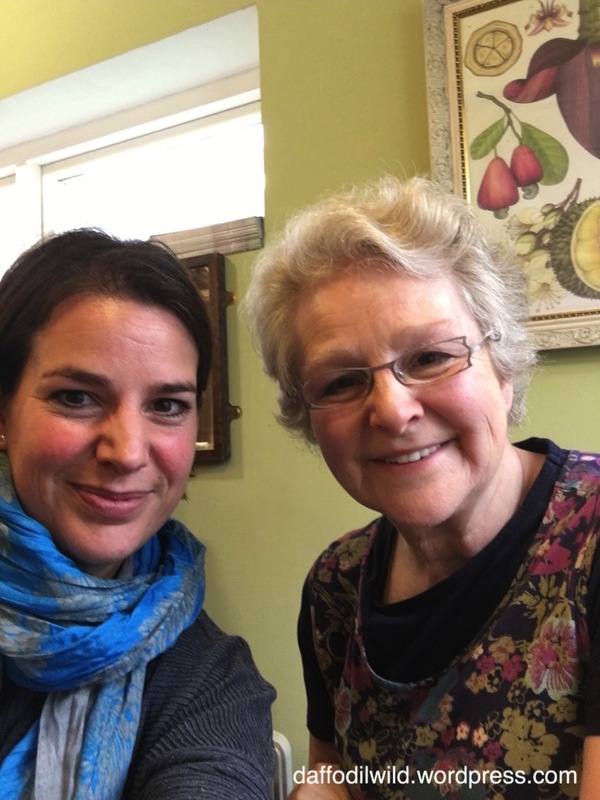 It was just wonderful and a rare treat to have some quality Mother-and-Daughter time – it felt a bit like my birthday! 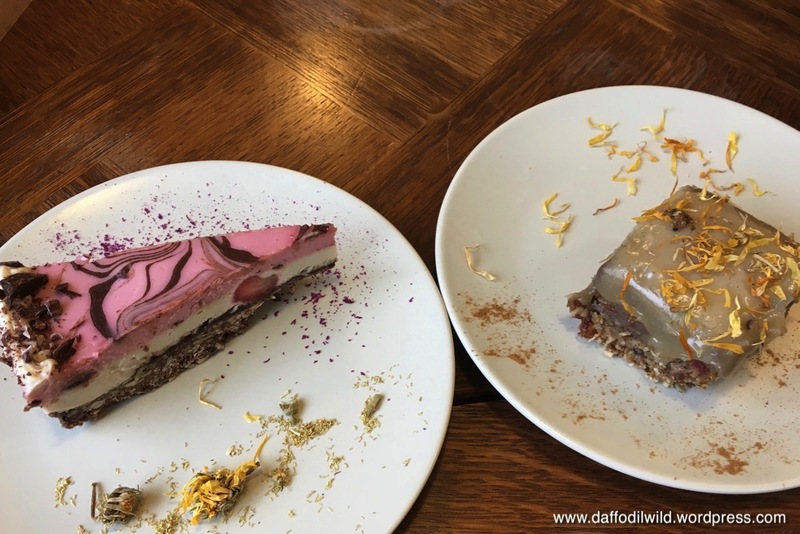 I don’t normally go for puddings – but at Feed the Soul they are unmissable! 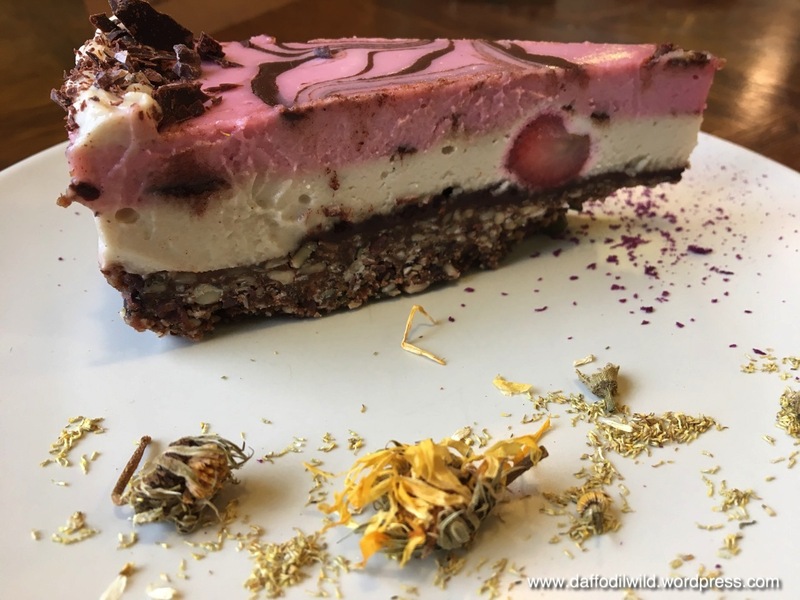 I wish I could send you all a piece – Yummmmmmmmmmmmm! What a lucky Mum I am! 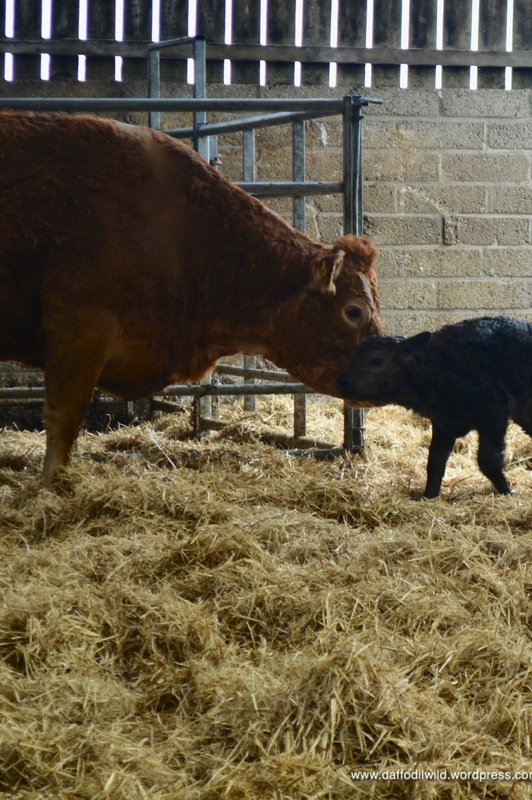 And then on Sunday I was in for a very special Mother-and-Son time, with my Farmer son who lives close by. 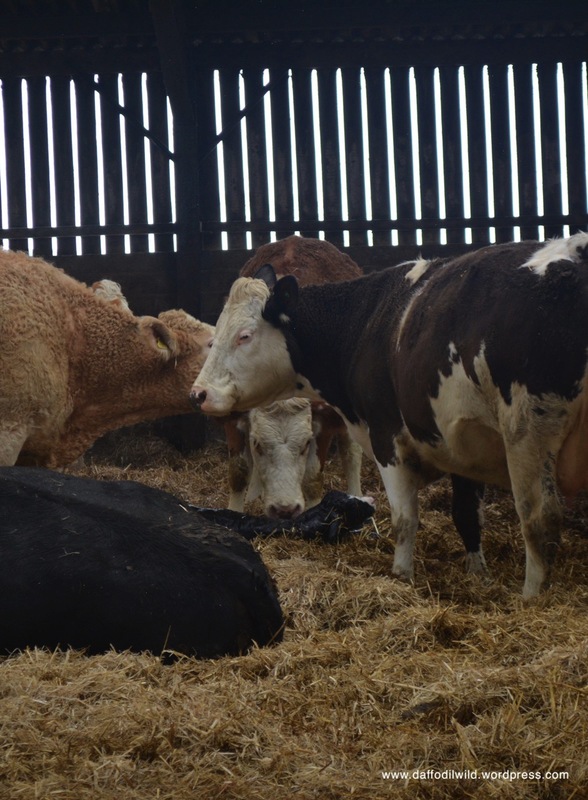 (not my Marathon Running Son who lives in London) For the first 37 years of my life I lived on a farm as a farmer’s daughter and then a farmer’s wife. 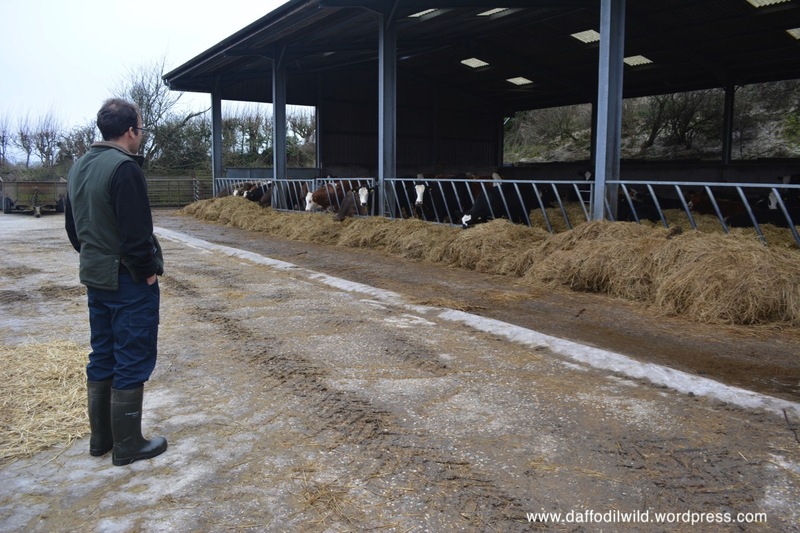 My husband and I ran a dairy farm and it is a long time since I was out checking on cows to see if they were about to calve – that’s what I did with my son on Sunday morning – such a wonderful nostalgic trip down memory lane. 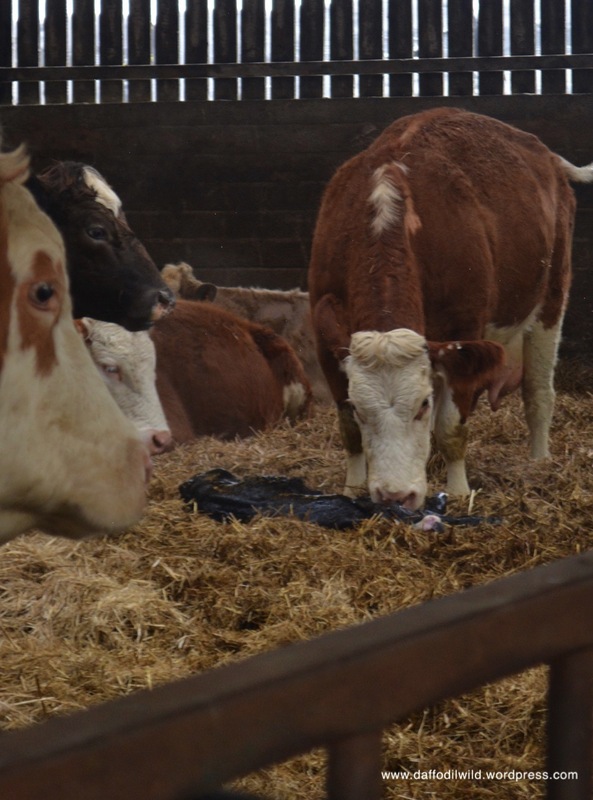 First, we looked at the young stock, munching away at their haylage, then after a lovely tour round the farm we went to look at the cows who are all mothers in waiting. 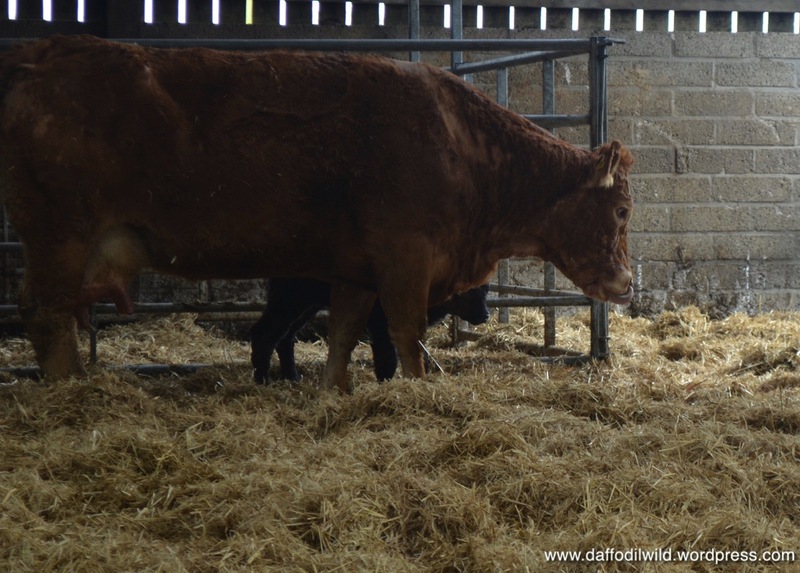 The cow got up straight away and started licking the calf …..
and was being visited by the other mums-in-waiting. The one on the left from A the one on the right from my son, HaHaHa!!! both with lovely messages inside. A truly Happy Mother’s Day. Whilst I was putting together yesterday’s enjoyable jaunt through the year’s galavanting, I skimmed past photos of all the things I have made. 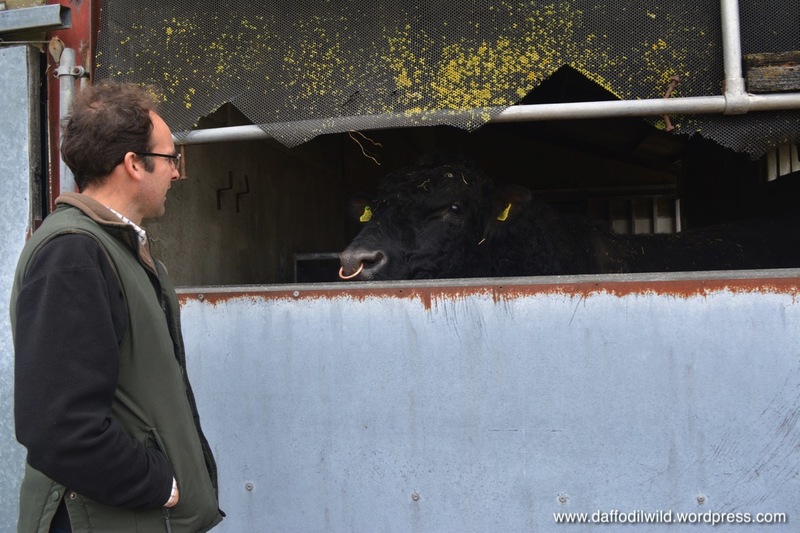 When I started the blog it was mainly to keep a diary of creative adventures. As you can see I have a grasshopper approach to creativity, jumping hither and thither, following thoughts, ideas and inspirations. It is easy for me to forget what I did and how I did it. Here I can store projects and methods, should I ever want to re-create them at a later stage. It is also particularly useful when I re-visit abandoned projects. I can remind myself of the tools I used and the links I followed. Going through my photos, gathering together all my 2017 makes in one place, has been fun. Many are still works in progress, but I have finished four crocheted blankets one for my grandson, The Wizard; two of them for my nieces The Mermaid and The Country Girl; and one, of my own bold zig-zag designs for my daughter’s best friend who wanted a blanket in Mexican colours. 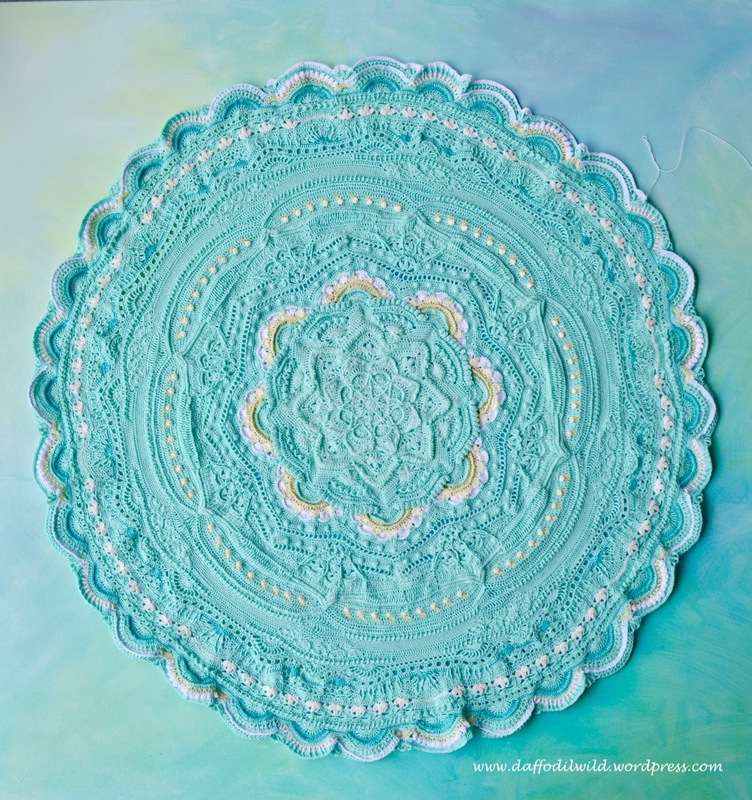 Creative collaborations make my heart sing and working with others to create new colour palettes is such a joy. Well I say a joy – the Wizard caused me some struggles as you know – but we got there in the end. I gain so much inspiration and knowledge from your blogs and Pinterest pages, it is thrilling to me if anything I share inspires you. Creative sharing has to be one of the BEST feelings ever! Please let me know if you think we could work together, that would be very exciting. Joining forces with Judy for our Silly Saturdays came about through a ‘Comment’ conversation and it has been such good fun inspiring each other in our shell art and poetry respectively. I thoroughly enjoy joining in with Cathy’s ‘In a Vase on Monday’ when I can. Flowers from the garden not always ending up in a vase. I’m looking forward to a creative 2018 and feel so very grateful for all the wonderful support and inspiration that comes from this fabulous community. A huge and heartfelt thank you to all the Wild Daffodil visitors and followers which makes this blogging journey such a joyful delight. I really do appreciate each and every comment and connection. May 2018 bring you happiness, joy and fun in blogland and beyond. Put three different coloured sheets one on top of the other and cut through all three layers together. Then have fun arranging the pieces you’ve created. Add a few doodle decorations if you like. Use camera settings, photo-editing or Photoshop to play around with different effects. And then there are the offcuts to play with…. Great for greetings cards. And I’m wondering about printing some out on canvas. They remind me of 1960’s designs. I think they would look good in a child’s bedroom or playroom, do you? There are quite a lot of You Tube tutorials about creating Notan designs – This one is a simple one to get you started. My entry in our One-a-Week Photo Challenge. I came across the Japanese Art of Paper Cutting called Notan, which uses positive and negative space. Go to Pinterest to see the most amazing examples. The photo was taken using the ‘Sketch’ setting on my Nikon D5200. Couldn’t resist a bit of doodling, and then it needed to go on a black background. Now some of the doodling looks like cut-outs. This is such a good activity to do with children aged 4 onwards. The designs would make great greetings cards. Please leave your link in the comments – Cathy and I always look forward to seeing each interpretation of the prompt – she has a corker this week! I want to welcome you to Seaside Land! Welcome to another Silly Saturday! I just LOVE working/playing/creating with Judy. I sent her the photo of a pebble and she not only created a fabulous fun poem but gave him the perfect name. I’m always excited to see what Judy does with the images I send her. Judy and I have been thinking about creating a little ebook of our characters and we thought Pete was just the right character to introduce the Stones and the Shelleys and possibly take up the role of narrator, we’ll have to see where he takes us. The first batch of cards have been printed! They are blank inside and all come individually packed with an envelope. What is it about seeing ones work in print – it’s thrilling!!! The guy who prints the cards hadn’t read the poems at first as he gets so many to do, but as he was checking through the proof he read them and just couldn’t stop giggling – he was still laughing as he was telling me how funny he thought it was. Lovely to get such a spontaneous reaction. The cards will be appearing in my Etsy shop soon. You, my lovely Daffodil followers, can have them a little cheaper at mates’ rates if you send me a message via the Contact Me Page. Judy and I have teamed up again to be Silly on a Saturday. Our Maggie has started to dream of new areas in which to expand her talents….. I wonder where she will take us next ….. any ideas of what she might get up to? Encouraged by your wonderful comments and support I am getting some of the Maggie pictures printed on Greetings Cards. I’m wondering how many to print? If you would like to buy one/some, it would be great if you could let me know by email. Which picture you would like and would you like the cards with or without the poems? Direct from me they will sell at £1.90 with poem and be 8″x6″ and at £1.50 without the poem, measuring 7″ x 5″. Postage will be added depending on quantity. I will put some cards in my Etsy shop, but they will have to sell for a little more there to cover the Etsy costs. Please go to the Contact Me Page to send me a private message if you would like any of the cards – thank you.